It was in August 2018, when I and Yvonne Gordon from The London Times national newspaper met in Brno. We spent together a lovely walking in Brno historical centre, followed with one or two 🙂 drinks in the famous Super Panda Circus Bar and an excellent dinner in my very favourite restaurant- Atelier Cocktail Bar&Bistro, which I always recommend to my clients for the dinner, if they want to experience local modern cuisine. 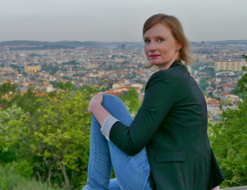 Yvonne has profiled Brno in the article Czech out the capital’s bohemian little brother. Since Brno day Trips is not about Brno only, but mainly about possible day trips to its surroundings, during which I have met interesting people who write blogs from their journeys. I am very happy if the trip booked with me happen to be listed in their travel diary to inspire more people to come. Such person was Joanne who traveled together with her family and despite of having very tight schedule, we really enjoyed time spent in my favourite Lednice-Valtice area and Mikulov town. Her output is found in the article The Best Private Guides in Europe!! Would you like to learn more about wine regions in the Czech Republic, with useful travel tips and posssible trips? Then the article Exploring South Moravia – A Czech Wine and Culture Tour written by Randi and Michael, who visitied South Moravia to explore wine and tourism potential, is right for you.